This past week I’ve also had a cold, so I’ve been drinking lots of teas. One thing I’ve been drinking is this herbal zap that I got at Earth Fare. It’s pretty inexpensive and tastes really good. It has a bunch of different herbs and immune supplements, so I’ve been drinking lots of that. I’ve been drinking lots of green tea as well. Instead of hot tea, I’ve been cold brewing it. You simply put some tea bags into a glass with some water and let it sit in the refrigerator overnight. It’s really refreshing! On Monday, a local vegan club I am apart of hosted a vegan dinner at an Indian restaurant in town called Mint. The chefs there made us all a delicious 5 course entirely vegan Indian dinner and it was delicious! I was only able to snap a photo of the main course, which was served family-style. To be honest, I’m not sure what everything was called but it was all so yummy! On Tuesday and Thursday, I have class most of the day so I packed some lunches and snacks to eat throughout the day. I’ve been finding that wraps are super easy to pack and eat for lunches. Also, carrots and hummus are always good for snacks as well. While reading, or working on different things I’ve been doing lots of snacking. 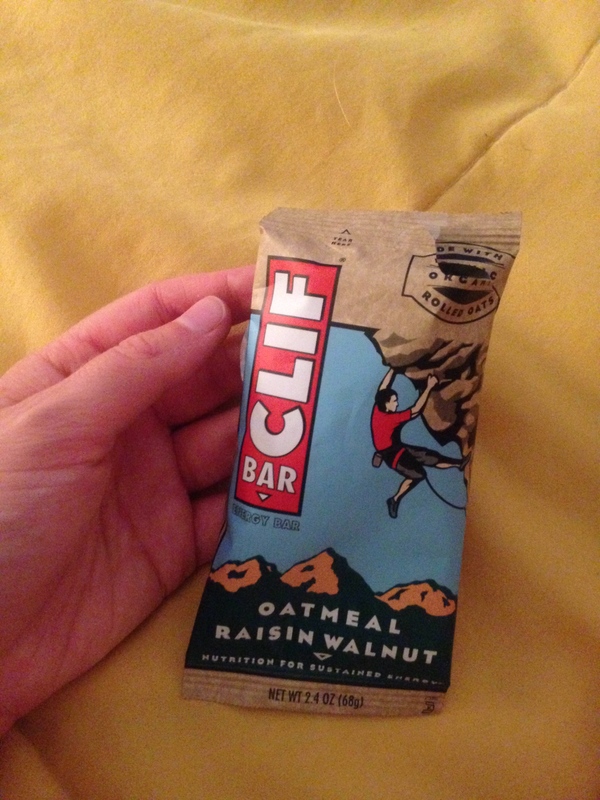 Clif bars and dates have saved my life this week! 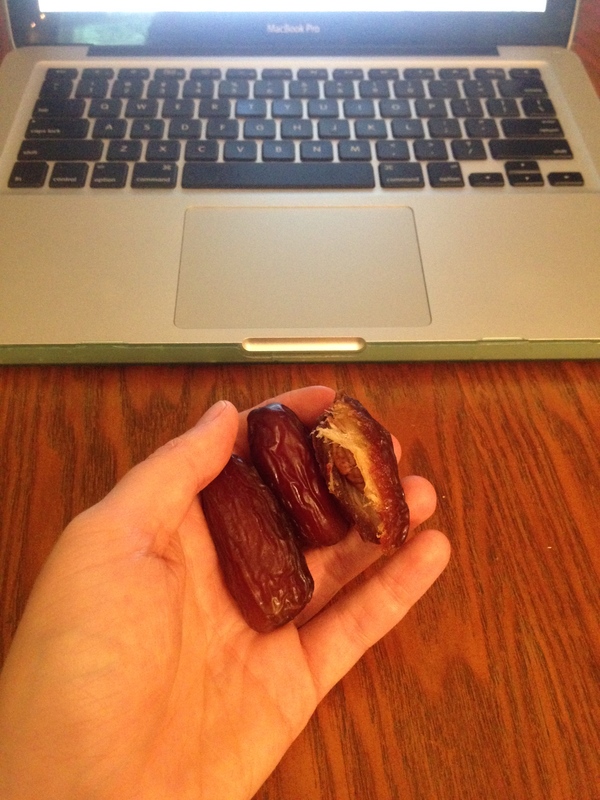 Such a quick and easy snack to grab and eat while doing work. For dinners, I’ve been keeping it super simple. 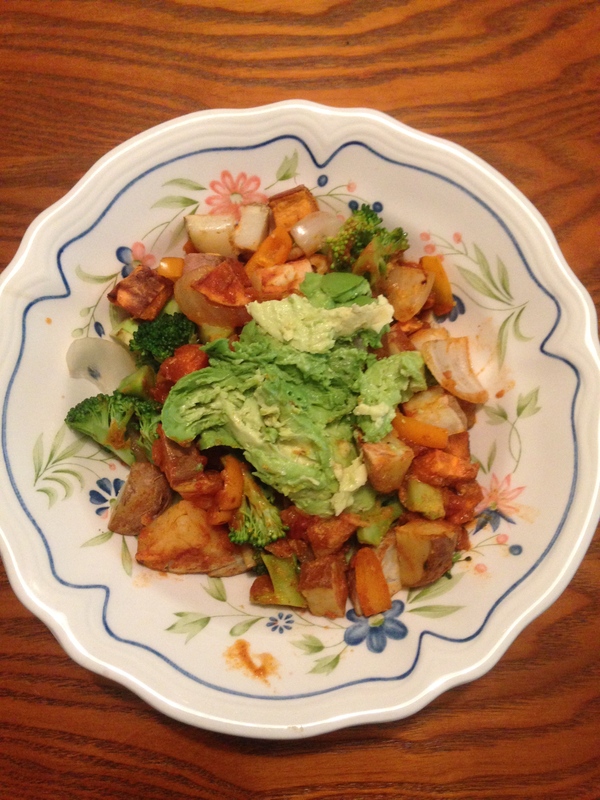 One of my typical dinners is just a simple bed of rice, potatoes, broccoli, onions, and peppers with curry simmer sauce and avocado. 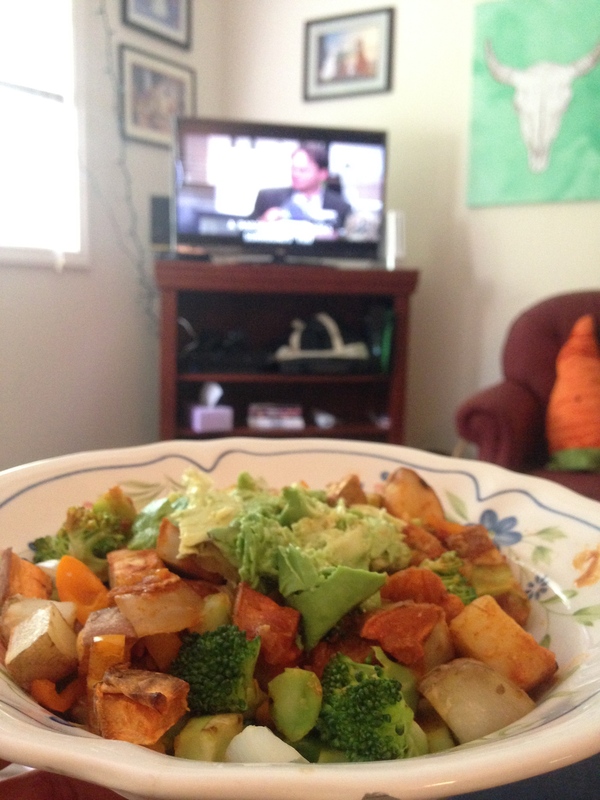 I eat this way too much but it’s just so yummy and all the ingredients are really inexpensive and tend to last a while. If you know me, you know how much I love The Office so I’ve been watching a ton of it this week while eating dinner. Perfect way to end a long stressful day! I put some hummus, sprouts, carrots, and cucumber in it! Packing food for a full a day at school is always difficult for me. I either over or underestimated how much I will need. PS I will split the vegan pizza at MM any day! Definitely agree with you! I’m working on finding that balance between too much and not enough.